These are some scenes we saw during our drive to and our hike at the Hashawha Nature Center on Saturday. I read the the word Hashawha is a Native American term meaning "old fields". During our hike we stopped at the raptor center, the raptors are birds that are injured in some way and can not live in the wild. The owls are some of my favorite raptors at the center. It is just sad for me to see them in cages. We passed this field of sunflowers along the way, I could not pass up stopping the car for some photos. I can just imagine how happy the birds with this field of sunflowers. They must be in heaven with a buffet of sunflower seeds. While hiking on the loop trail we passed by this small pond. I see a large owl box towards to back of the pond. It would be cool to be there when the box is in use. 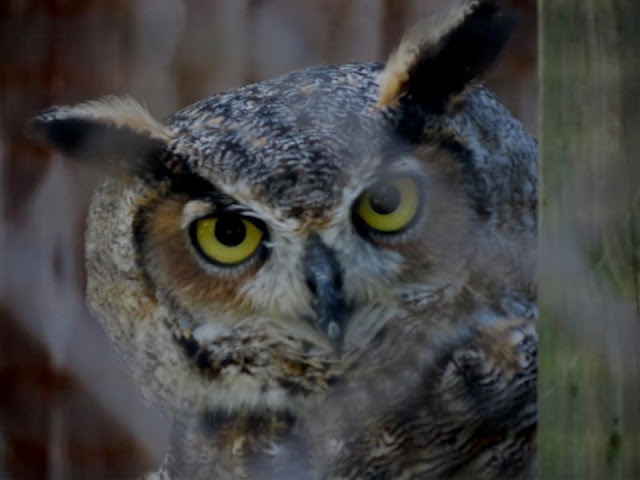 At the Raptor Center I zoomed in on the Great Horned Owl's face trying to remove most of the wire fence in front of us. The owl has the coolest looking eyes. They also have a Bald Eagle, Red Tailed Hawks and a Barred Owl. The loop trail also took us by this field, I like the layer of colors. I was hearing all kind of birds along the walk but except to see one flying away I could not report a specific bird. We walked past this old 19th century log cabin, it is not in use except for historic reasons. I love the wood and the big stone chimney. Around here I saw some Cardinals and heard a very noisy wren. We saw lots of American Goldfinches on this field of yellow goldenrod. There was also some pretty purple thistle mixed in that attracted the birds. I believe I had some quick glimpses of a few Orchard Orioles. We ended our walk near alarger lake filled with lilypads. As you can see with the pretty sky and cooler temperatures, we had a beautiful day for our hike and some birding. Thanks to Mary of Mosaic Monday and to the hosting group of Our World Tuesday: Arija, Gattina, Lady Fi, Sylvia and Sandy . Thanks also for stopping by to see my post. Have a safe and happy week! Wonderful photos Eileen. Looks like we both visited simalr places this weekend. Great photos of the sunflower fields, and all the things on your walk! Love that cabin...and the lilies. What a great place to walk! Looks like a Great place to visit. Lovely Mosaic and pictures!! That was a beautiful hike,thanks for taking me a long. I love the lone sunflower standing tall amongst the wilted one. The lakes, fields and hut are all lovely shots. The owl super the wire almost disappeared, well done. the sunflower fields are thick! That lake with the Lily pads looks a lot like the lake behind our house. The Sunflowers look tired. What a wonderful day out with lots of great places and things to see. I especially like the old log cabin, reminds me of Little House in the Prairie. Wow those sunflowers looks like they are bowing to the king sun! ^_^ Beautiful! You're making me anxious to get out and see new sights. The sunflowers are beautiful and we always enjoy seeing the raptors that are being taken care of. The owls are always our favorites! Beautiful photos! Next time I'll come with you! heehee! That walk is fantastic and the owl stole the mosaic. Sitting right smack in the middle with that incredibly expressive face...he's amazing. You find the nicest places to hike Eileen. I like the field of sunflowers with all bowing their heads except one. You find the prettiest places to visit, Eileen! Gorgeous shots. Such pretty sunflowers. The owl is so cool :) Have a great week! Looks like a nice outing...can't believe how full that sunflower field is. 'Hope you had a nice weekend. Wonderful collage, Eileen! Looks like a lovely day. So enjoyed taking this hike with you, the scenery is stunning. Amazing sunflowers, fabulous header shot! I love your settings, the landscapes and owls head, awesome. So sorry for my belated comment. Yes, amazing scene, picture of sunflowers♡♡♡ Oh, and superb shot of owl trying to remove the wire fence!!! "The Pond"............that is so tranquil looking. I could sit there for hours and hours!!! Eileen~ What wonderful photos! I love that you were able to zoom in on the owl! WOW! What a collection of photos you have shared. All wonderful but I have to admit to having a few favorites. Love the sunflower in the field and that log house is fantastic. I would love to spend some time on that boat dock at the pond. Catching that owl was sure a stroke of luck as well. Loved the sunflower field . . . a feast for the birds indeed. Golden Rod is a gorgeous wave of color, pretty to see, unless allergic, like me . . . smile. You take us on wonderful vista hikes Eileen. Loved the close up Owl eyes . . .
Ah, now that was a wonderful hike. LOVE your Header, and those Owl eyes are pretty cool too. Great post. Beautiful shots of place. There is something for everyone. I love going on travels with you Eileen and seeing your corner of the world - always so interesting. Have a wonderful week and thank you for stopping by my blog today. Yes, the native orchids are so beautiful aren't they. And what a scourge that invasive grass is! Hi Eileen, Love that Owl! Nice pictures. That cabin must have been interesting as well as the wildlife and birds. Have a wonderful day! I love owls!We have them here where i live!The photos of the sunflowers are amazing!All the photos are so beautiful!Wish you a lovely week Eillen! what lovely photos, the sunflowers are amazing! What a great walk you took. Lots of scenery and birds to view. I love the owls also. They are not meant to be locked up but if they are injured then they can't really let them loose. Thanks for coming by. This is a wonderful nature center. I would like to have hiked it myself. Your photos and that of the Great Horned Owk are wonderful. I'm amazed by your photos! My husband loves owls and I will have to share your photo with him. We went to a Raptor Center a few years ago. You have captured such a beautiful place. What a wonderful day. Love the photos, and I am glad you pulled over by the field of sunflowers. I would love to pass by a field like that! Eileen I enjoyed taking this walk with you...such blessings. All your pics re amazing ! I love the sunflowers & the owl! That shot of the owl is just incredible! Great sequence, Eileen. Boom & Gary of the Vermilon River, Canada. Beautiful scenic views. The sunflowers are especially beautiful. I love sunflowers. It would be wonderful to see a whole field of them! I also love the shot you took of the owl! Another beautiful walk. The rescue programs are hard for me to see but I understand their educational purposes and hopefully some of them get to fly around once and awhile. As for birds in the grass......well that's a tricky bit of birding. I tried it yesterday....very very difficult. 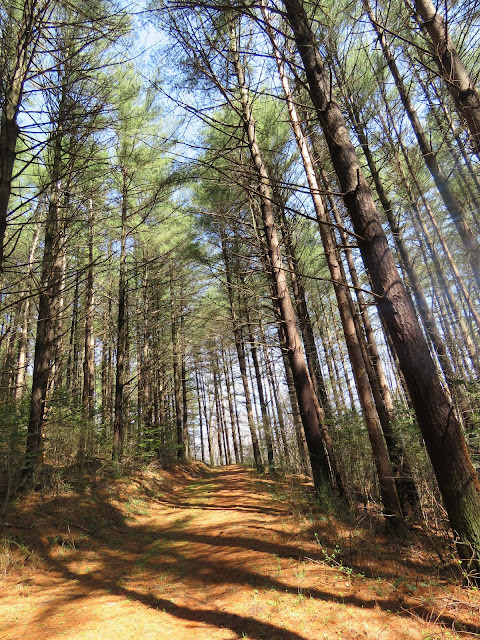 What a wonderful walk you've shared with us, Eileen!! I love the flowers and colors and the owl is awesome!! That old cabin is terrific!! What a great place to visit!! Thanks for sharing the fun and the beauty!! I adore your owl photo! You have created a wonderful mosaic with your beautiful nature photography. I loved seeing the pond too. What a pretty place. That owl photo is very dramatic. I agree about loving his eyes! Gorgeous collage and nature photos! Great capure of the owl! Like a dream. Thank you. Please have you all a good Tuesday. a perfect place to spend a day or two. Great nature and the owl is gret. I love that cabin. it is really beautiful. Gorgeous photos, Eileen and the mosaic is fantastic! A grand collage/mosaic Eileen, and the individual shots are great too. Love the owl and the lily-padded water. What a great nature center, I'd love visiting it. Nice photos! I would LOVE to visit the raptor centre. It must be sad to see them caged, but at least they have a life, which they would not out in the wild. I would like to see them up close since I still have so much trouble identifying them in the wild. Wow, that must be a good walk! I am envious with those of you who can walk long distances without feeling so tired because it is cold, while we here in the hot tropics cannot do the same length without being almost dehydrated, haha! I wonder also why among that sea of sunflowers, just 2 of them seem to be late bloomers. The fields are amazing! I go with you, i pity the raptors in cages! Thanks for sharing your trip - Great photos. I bet the birds do love their sunflower buffet. :D Looks like the weather was perfect. Beautiful mosaic Eileen, really wonderful series of pictures. What a great place. What a wonderful place to explore. I loved all the shots but owl and sunflowers were my favorites. Beautiful landscapes! That owl is an impressive bird. Once you've seen a sunflower field, you never forget it! I also love that watery place...thanks for taking us with you! I see -you're on Pinterest too! A beautiful display of photos! The sunflowers are glorious and the fields and lake... I think it's time for me to go to somewhere like this - all I've seen in the last ten years is desert! It is always so nice to visit your blog and see all your beautiful photos. Fantastic mosaics too. I eally do like the owl. Enjoyed the tour but loved the photo of the sunflowers. They look as though they are bowing their heads to the sun and saying good-bye to the Summer. Beautiful....but I really want to know this...inquiring minds wanna know....how do you pronounce HASHAWHA? That owl just stands out above all else in your collage. A very nice place to visit Eileen. I have never seen so many Sunflowers together, stunning...what a treat for the birds eventually. As you say, sad to see birds in cages but it sounds like they are doing a good job for them. Love the hummer on the last post, gorgeous! Great photos of the owl! Wonderful collage and wonderful place. Your sunflower field makes a beautiful header too. 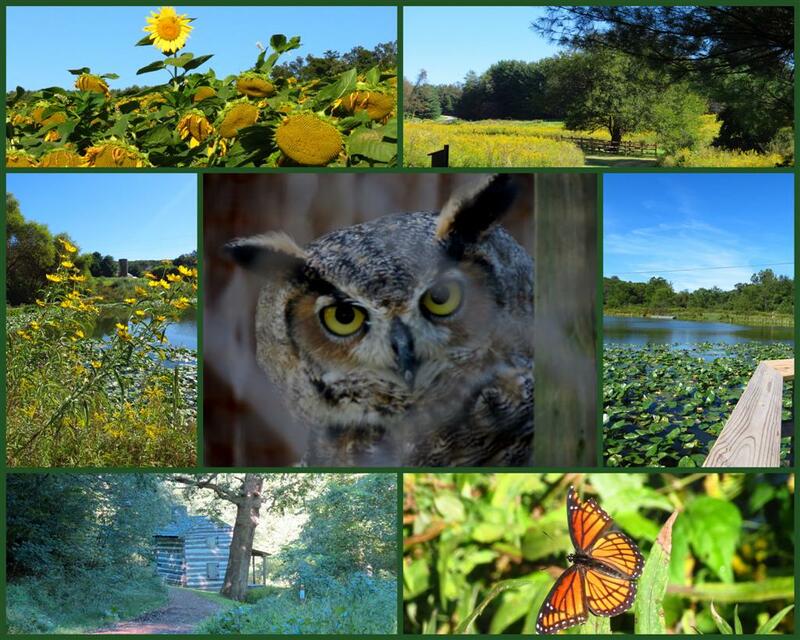 What a wonderful Nature Center! Gorgeous pictures! Eileen, just gorgeous! Love the fields, the sunflowers and the old cabin! Wow..I love all the photos, Eileen! I love your header too. Passei para agradecer a visita ao blog. Fotos encantadoras, principalmente a dos pássaros, amei a corujinha. Uma boa semana. Até breve.